These calcites are from Cumbria England. They differ from most other calcite, because they fluoresce best under mid-wave fluorescent light. The first image was taken under mid-wave fluorescent lighting. The coloration is more intense than the short wave image presented below. 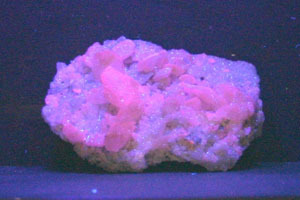 For other images of this mineral, go back to the main fluorescent page and click on the view specimen material from England link. Size: 3-1/4" x 4-1/8" x 1-1/2"